I hope you enjoy them! You are welcome to play with these as much as you want and use them anywhere you’d like. You are NOT allowed to sell them ever. You don’t have to but I’d appreciate a link back if you do use them. Wow Karen! Thanks so much! These are beautiful! Thank you for sharing. I’ve downloaded these to hopefully use with this years Christmas layouts! I can hope I remember to use them…. 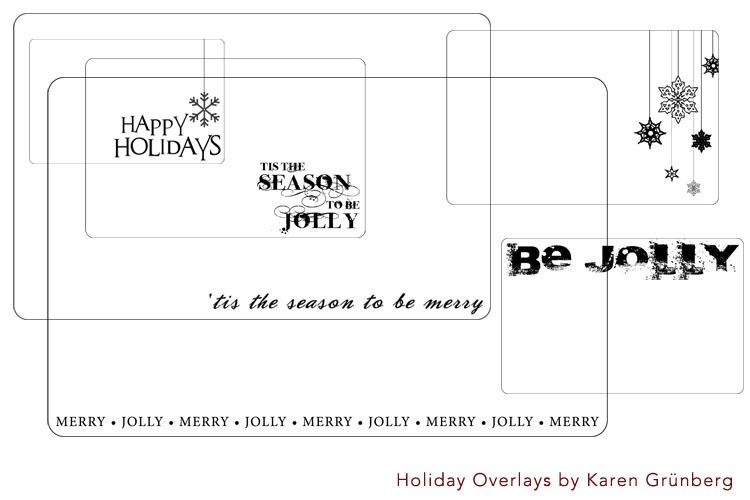 thanks for these free overlays, and the tutorial. i’ve never used them before and am excited to try! Oh great Karen! Thanks for the free download. Will try to use them in my DD soon. Thank you for the overlays!!!! I will be using them for my Christmas album. Thanks Karen. These are fabulous! Thanks so much 🙂 You are so generous! Thank you. I really like them and hope to use them in my dec. album in which i am a bit behind. THANK YOU so much for these!!! I’ve wanted to make my own but can’t figure out how to do it so these have come at the right time!! Thank you so much for the overlays, I am using them on my december daily! Thank you for the overlays!